Wilson Combat® has been supplying serious shooters and professionals with the worlds' most reliable and durable .45 auto magazines for the past 30 years. They are used by the worlds' most Elite U.S. Army SPEC OPS unit, FBI SWAT, Thunder Ranch and professionals worldwide. NO other .45 magazine on the market can compare for proven inherent reliability, durability and the ability to remain fully loaded for long periods of time without damage. Our magazine springs are specially fabricated from the highest tensile strength heavy duty spring wire for long service life enhanced feeding and positive slide stop operations. Our magazine bodies are manufactured from .025" (the thickest in the industry) aircraft grade certified 17-7 PH stainless steel and heat treated for maximum durability and service life. Our dimensional tolerances are held so close that you will never encounter a Wilson magazine that doesn't drop free from your pistol or that your rounds are tight inside the tube as long as your pistol and ammo are close to proper specifications. Purchased a Wilson Tactical Elite and 6 47D magazines. The weapon and the magazines function flawlessly. The workmanship is obvious and the quality of build is self evident. Have cycled 4,000 rounds through this platform and magazines with no issues at all. I feel confident that these magazines will not fail me. My Kimber came with a magazine. I didnt even bother with it; its in the case my gun came with. These Wilson mags are the ones you want. 1911s can be finicky and sometimes FTE, FTF or other malfunctions. Often, a crummy mag is the cause. Just dont fool around. Buy the Wilsons. YOUR GUN WILL LOVE IT! If you have ever had feed problems or wonder why your 1911 doesnt stay locked after the last round, most of the time its your factory mag. I buy these with every 1911 I get. They are easy to maintain too. At first, the magazine was not allowing me to 8+1. After 2 weeks, I am able fully insert a full magazine with a round in the chamber. No feeding issues on a Para-Ordnance X 1911 LTC. My Para BlackOps would not feed with its supplied mags out of the box, not even with CMC 10rders. So as a last resort I bought the Wilson 47D mags which I should have done that in the first place. Not a single misfeed or malfunction of any kind. I plan to buy at least 2 more and 2 10rders from Wilson. Thanks for a great product.!! I have 5 of these for my Springfield Armory Range Officer. I also have 2 of the ss 10 rd mags & 3 of the 10 rd black ss mags. All work as you expect from Wilson Combat. A reliable 1911 deserves reliable magazines. BUY THEM, YOU WONT BE DISAPPOINTED!!!! These magazines have really made every 1911 Ive owned more reliable. Amazing quality and reliability. Order plenty and know your gun is going to work every time. I bought 3 of these mags and they are like everything else with the Wilson Combat name on it.... AWSOME.. They function flawlessly. I will be picking up 3 of the 10 round mags next. These mags are the highest quality. After working through numerous failure to feed issues with a new Springfield Range Officer these Mags resolved the issue. Sold on Wilson Combat. I own a total of 26 Wilson 1911 mags, best on the market, smooth as silk! I bought a used Sig Scorpion full size 1911 and immediately had a lot of failure to feed issues... I replaced the mags with these new Wilson Combat mags and have not had a single issue since.... I will be buying more soon!!! I ordered a few of these for my Springfield loaded 1911. They fit great, function great, and look great. Top of the line magazines! Been using Wilson mags in all my 1911s for years now. Ive tried a few others but keep coming back to Wilson. No matter the 1911 brand, a Wilson mag makes it better. Dont forget to keep plenty of Wilson mag springs in your parts bag, as well. Bought six of these for starters to replace the junk mags that came with my springfield operator. Couldnt have made a better choice. Quality made, reliable, affordable. Unlike other companies, wilson combat has delivered in every way, with great service, prompt shipping, and genuine interest in your satisfaction. Quality, quality and did I mention quality, these magazines work flawlessly and with any type of ammo. The price of these magazines is small compared to knowing they will function correctly every time! The Best 1911 Mag EVER! Wilson Combat 47D magazines are the best EVER! They work every time, with every 1911 I have ever shot, and with every type of ammo. No Exceptions! Even great mags need proper post-maintenance assembly. I have two 8 round mags with standard baseplate. These are the best most reliable magazines I have used at any price. Even Dads old 1911 made in 1917 loves them. Imagine my surprise when one magazine stopped functioning flawlessly. The cause? After cleaning, I had reassembled the spring upside-down and backwards. See the video. The spring has a top and front that fits inside the follower a certain way to keep the follower properly aligned. PROPERLY assembled the mags work right every time. I CCW three 1911s -a Kimber, a SIG, and a Colt. All three pistols came with so-so magazines that FTFd after about 200-300rds. A friend recommended Wilsons and now I own about 40 of them, 7, 8, & 10rds; never an issue with any of them -even the six i accidentaly left full for over a year shame on me! Will never put anything else but a Wilson up the mag well of my 45s! Excellent product! These are the best magazines Ive used for my 1911. No jamming and incredibly reliable. 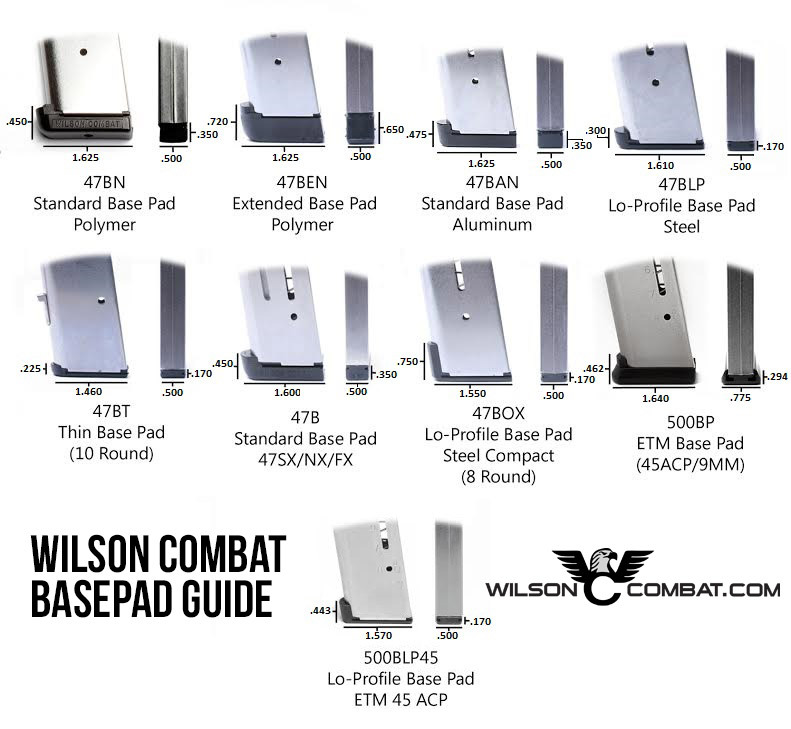 Aside from the magazines quality, the customer service at Wilson Combat is unbelievable. I ordered 2 of the 7 round mags and they were too short. They wouldnt lock and I was unable to load a round in the chamber. I got in touch with the folks at Wilson Combat and they went above and beyond to help me. They had me ship the magazines back and exchanged them for 2 of the 8 round magazines. Wilson Combat was highly recommended by a friend when I first bought my 1911. Its safe to say that after this particular dealing with them, I will be a customer for life. Thank you Wilson Combat! This is the standard that all .45 ACP mags should be compared to. Reliable. Best I have found for my Kimber. I tried many types of magazines when I first purchased my 1911. Out of all the magazines I tried, the Wilson Combat 47D magazines are by far the best. I have since sold all of my magazines that were not Wilson Combat 47Ds. Pros: easy to load, follower does not bind, very smooth function, never fails to feed. Cons: higher price but worth it. I recommend these magazines to every 1911 owner I come across. If you shoot a 1911, I have two words for you...WILSON COMBAT!!! Wilsons are, simply put, the best 1911 mags on the market. Period. IMHO. While at the USPSA Nationals in St George, Utah, I saw a guy with a whole bunch of Wilson 10 round 1911 mags. I asked him is there any other magazine on the market that compares? In his thick German accent he simply said, Not really. Then he proceeds to shoot one of the cleanest stages I have ever seen. If the Germans say theyre the best.....hey. They fit, they function, they last. End of story. The only Mags I use, makes all 1911s run better, never a failure, just bought four more for my Kimber at a great price. Thanks Wilson Combat. Best Darned 1911 Mags Ive Ever Used. I have 2 Kimber 1911s, and after trying the Wilson 47D, threw the stock mags away. I CCW every day, and carry 2 extras in a dbl holster. Bought 10 so far. I just purchased three magazines for some of my 1911s and after 50 years of shooting I have found the perfect mags. I have used many different mags over the years with some being bad and some being good. These Wilson mags are just pure perfection. Try these and all your other mags will find there way to your junk drawer. Purchased two Wilson magazines for a LLama Max I 45, flawless performance, do not use the original magazine. This is another incredible example of what Wilson Combat does best, make the best 1911s and accessories for them. I have a Colt 100 Years of Service pistol, and decided, upon recommendation from other 1911 owners, to get an extra magazine for the gun. Wow! After using the 47D just a few times, I was so impressed that I went out and bought 5 more 47D magazines! Look no further if you want another magazine, or 5, for your 1911! I have a springfield std i have 6 47d mags and they work great! these are the best mags i have ever used. never had a problem with them. keep up the good work. Using three of these when I carry my Sig Sauer Scorpion carry. Purchased them because after 500+ rounds my Sig mags were already having feeding issues. Fantastic design. Highly recommended. These are by far the very best, fit and functioning magazines that I have purchased so far. When your life depends on your equipment you have to demand the very best in reliability and function. These mags live up to that in every type of environment, there are no better mags out there! Ordered 4 of the 47D mags for my Sig Sauer 1911 T-45-TME and they fit and function perfectly.Have shot over 500 rounds of 230 gr.FMJ and JHP and not 1 FTF or FTE.Wilson quality is a sure winner. Perfect in every way. Fit, function, quality all outstanding. I will be buying many more. Wilson Combat. The name says it all. Great Customer Service and very prompt shipping. The 47d and ETM mags run flawlessly, everytime! I trade or give away my factory 1911 mags that come with whatever gun I buy. The only magazine that locks in my magwells are Wilson Combat. !!!! !THE BEST MAGS BY FAR!!!!!!!! Hands down the most reliable mags i have ever used. Had issues with my Sig Sauer Scorpion Stock Mags, and Bought a Few Wilson Combat Mags and boy, do they make a difference. Best on the market for sure. Never had a jam yet with the Wilson Mags. !!!! !THERE AWESOME!!!!! Every 1911 I own has an additional 10 magazines for ease of range use and a few for extra load protection. I want the best so I come to Wilson for them all. Top grade and never a problem. Quality = Wilson Combat. After having many ftf with a new pistol that company told me that I needed a 200 round break in, the only thing was that I had many more rounds through the pistol already. instead of doing anything with them I went and bought Wilson Combat 10 mm mags after that all the problems went away. I sold the pistol and I still have mags. thank you for making some of the best products in the market. I still use those mags in other 10mm pistols. I TOO HAVE A KIMBER CRIMSON PRO CARRY AND HAD ISSUES WITH THE FACTORY MAGS. WILSON 47D MAGS SOLVED THE PROBLEM. I DO NOT CARRY ANYTHING ELSE IN MY .45S!!!! Best mags ever made !!! I now own 7 of these mags and and gotta be the best out there.easy to load and use.top of the line. will be buying a lot more from Wilson Combat. These mags have become the standard for 1911 lovers. Ive also gotta plug Wilsons customer service for holding true to the old saying, the customer is always right. I have a kimber pro carry II and had many issues with not only the factory magazine but with mags of another name brand manufacturer. Once I replaced them with the Wilson Combat mags I have had zero issues. These are the only magazines I will use in my 1911s. Replacements for my Kimber Pro Carry II. Well built, good looking, and absolutely zero FTF/FTE. Highly recommended. The only 1911 mag there is! Purchased 4 for my Sig Extreme. Wilson Combat mags are flawless. Wont consider any other. Wilson Combat is one of the last few companies that still value their customers. Their products are legendary and their customer service is outstanding. Its simply a no brainer. Whenever you need 1911 parts Wilson Combat is the way to go. If you need a dependable magazine for your 1911, there is no better magazine on the market. Use your mags in both my TRP operator and my Sig Scorpion never have an issue Awsome product. I bought 3 Wilson Combat Mags for my Ruger SR1911. They are at least the same quality as the Ruger factory mags at about the same price. They functioned great with 4 different kinds of ammo including FMJ and JHP with brass, aluminum and steel cases. I would recommend these magazines. I had one jam after over 100 rounds but the barrel was getting pretty dirty. I had been having FTF problems with my TRP and Operator. No longer!!!! Bought a 47-D and after 500 rounds no probkems at all. Now for a Wilson Combat 1911. Love these mags, my springfield 1911 would missfeed and have failure to feeds all the time after using these mags all of those problems have been eliminated. Couldnt be more happy with them. This magazine lives up to its promise. Ive used them in my Wilson Classic and Les Baer Premier II without any problems. Ive tried others, but this is the best! Simple, elegant, refined... I picked up a couple of these after doing a little homework. My original Kimber magazines are ok, but these are clearly more solid, and appear to be more durable. The follower and edges are smooth - no snags or scratches! I think Ill pick up a couple more in my next order. I have recently gotten 2 of these mags and all I can say is that they are better than my Chip McCormick or original Kimber mags! I have just started handgunning but already own a couple of NON Wilson Combat 1911s. Imagine my surprise when I discovered that Gun A did not like Gun Bs magazines ...and vice versa. Wilson Combat to the rescue! The 47D 1911 Magazine works flawlessly in BOTH of my pistols ...maybe even better than the mags that came with the pistols! I have quickly learned that Wilson Combat only sells me things that work well. These mags fit and function perfectly, and that is just to say the least. Flawless feeding with any round I have tested. The base pad is very durable and adds a clean look to the 1911. Wilson you have set the standard for 1911 magazines with the 47D. I have been using the 47D mags for 8 years now and NEVER had a failure to feed in my Springfield SS 1911. They are quality, awesome magazines, and work well with occasional cleaning and care. I trust my life with them. I have been using Wilson Mags for all my 1911s for nearly 20yrs now. I have never had a single magazine related problem in 100s of 1000s of rounds sent downrange. It doesnt matter if they are loaded with defensive hollow points, standard ball, or even lead SWCs, they just work. It doesnt matter if I am using them in my carry gun or one of my competition guns I know I can count on Wilsons 100% reliability. I have never had a smoother mag.The fit and finish are top notch american made quality.I will be ordering more of these mags to replace all my 1911 mags. AWESOME PRODUCT PERIOD no need to look at any other mags these are the ones to use. I had 6 47Ds, Just bought 8 more, and retired the ones that came with my 99 year old Colt military 1911, stainless Springfield, and Baer premier 11. Like Forrest said, One less thing to worry about. Now if I can only get Santa to bring me one like Mr Wilson carries. I have tried numerous non-factory Mags and its not surprise the WC mags are always the best. Smoothest loading and cycling, I have never had a problem with WC mags. spring retention and smooth following are trademarks of WC mags, perfect. Splurged on a new Kimber Super Pro Carry .45ACP recently. Bought one spare 47D at the gun store, then immediately ordered three more directly from Wilson Combat on-line. Finally went to the range today - the 47D magazines were much easier and even to load than the one that came with the gun. I have a number of different semi-automatics, but was really impressed with the 47D. Shot 150 rounds through the brand-new gun with zero problems. The magazine is a standout - real quality you can see and feel. Highly recommend. The only choice for me! Of the half a dozen 1911s that I own, Wilson Mags work in all of them without flaw. Other competitors ask me why I keep winning the local combat pistol matches? I tell them that I do not skimp on my magazines which is why I do not have any equipment issues and can focus on my shooting skills. When your life depends on your tools going bang each and every time, Wilson Magazines are a must have. Practice, train, and you too will see why these magazines are the only ones Ill use in my 1911s, regardless of manufacture. Thx for a great product. I have a Colt Series 70 .45 acp that was Wilson- modified with the then-available full bore package. Work was done in 1988. I have some 10 Wilson magazines that have functioned flawlessly through this pistol. If you choose Wilson, clearly you choose Perfection! I am a 1911 guy who has purchased many mags and these are by far the best. Reliability is key to all shooters either for sport or protection and these mags are in the gun next to my bed and in my range bag. I ordered one for a friend and now he is loading up too. I will never buy another brand. Thanks Wilson! I love these magazines. They are my preference in 1911 magazines by far. Every 1911 owner should be running these mags. I have four of these magazines so far and they are without a doubt the most consistent feeding and durable magazines I have used. After switching over to running these mags in my Range Officer I have had zero rounds fail to feed. These are carried on me in my concealed carry so yes, I would bet my life on the reliability of them! Great except for the followers. I have two 1911s, both from quality companies, but neither is a Colt or Wilson. Neither will lock back on empty reliably with the 47Ds. I have never had a failure to lock back in either with four OTHER brands of quality magazines. Im sure these work fine in Wilson 1911s, but they dont always work with other brands. The Kimber FIX Wilson 47D 8round. I Have had a Kimber SIS pro for the last two years. I bought it NIB. It had failer to feed, failure to eject and failure to battery forward. I had my gunsmith put in a new wolf guide rod spring, polished the feed ramp,throat the barrel and tune it. That fixed 85% of it.I just got a 47D mag and it now runs flawless! I am now saving for my next 1911. It will be a WILSON!!! Wilson will always be in my carry piece. I just got my Wilson Combat mag a little less than a week ago and right out of the package I could feel how sturdy it was and how smooth it inserted and dropped out. I had no trouble loading it, not even the last round. Ive had feeding troubles with my other magazines in my picky springfield gi model, but this fed every last round just right all the time. I would feel more than confident to carry this in my pistol with me. The only issue I had was upon inserting the magazine, it snagged on the magazine release. Ive noticed on other magazines there is an identation or bevel to help slide past this. I have to put a considerable amount of force into it to get past my mag release. I dont know if its my release or the magazine, but it should be a simple fix for me. 5 stars because I dont need to insert the magazine before using it in a hurry. Its already in and I know its going to work as intended. Thanks WC. I just got this magazine in the mail today and ran it through my regular mag tests. checked for wobble while inserted, slide lock, chambering on full It passed my tests. It sits very solidly in the well with very little movement, operates the slide lock flawlessly and had no problems feeding rounds which is a problem I have been having with my 1911 where the round nose dives and gets caught My only complaint would be that it did take longer to get here than I had expected. However, the quality of Wilson Combat I think is worth waiting for. All in all Im very pleased with it. I always hear people talk about how Wilson Combat magazines are expensive. I dont consider these expensive at all, because you are not just buying a name. You are buying trust in your firearm, you are buying reliability, you are buying those few extra second when other inferior magazines would cause a jamb, and quite possibly you might be buying your life with it. You are buying Wilson Combat. I would rather spend the extra ten bucks and know my pistol WILL WORK when I need it to. And not trust in a inferior product hanging on the hope that it continues to work right for me. Sure other mags may work right now, but do you really trust them to continue to work in less than optimal conditions, when you really need them, when your life depends on them? Probably not. Buy Wilson Combat, your life is worth it. I just picked up four more 47D magazines for my 1911 pistols. I have found these magazines work flawlessly in both my CQB ,as they should, and in my Colt Lightweight Commander. It is great to use one magazine in both pistols. The magazines are made of high quality stainless steel and they are a breeze to clean. The 47D is the easiest 1911 magazine I have ever maintained. The spring life is great but when it is time to change them out the process is fast and easy. I use the 47D for both my range work and for my carry weapon. I have found the 47D to be dependable and they handle every type and style of bullet from hardball to wad semi wad-cutters without problems. Since my Colt has an alloy frame I look for magazines with non-metalic followers, as some metal followers can damage the feed ramp, the 47D fits the bill. If your gun cabinet holds a 1911 pistol or several 1911 pistols you can not go wrong with the Wilson Combat 47D magazine. These magazines are just as good as the factory supplied ones that came with my new SIG 1911 Tactical Operations pistol. I replaced all of the standard size base pads with Wilson’s extended pads because of some seating problems due to the SIG’s thick, oversized and beveled magazine well. I now carry the items in a Tuff Products 8 In-Line pouch with the SIG in a SERPA CQC holster. This system is as good as it gets! These are the finest magazines I have used in my 1911, would not hesitate to recommend them to anyone. Round after round consistency. Thanks for the awesome mags WC! I just wanted to drop you all a note about your 47D Mag. I have a Kimber series 1. I was having feeding problems. I put new springs in and the problem persisted. I took it to a gun smith and he looked at it and told me it would be two months before he could look at it. I told him I did not want to wait that long. I was so frustrated. I looked over the 1911 forums. The cure according to the internet community was buying a Wilson Combat 47D mag. I was skeptical, I really was. I went to the store and got one. I really cant tell you how happy I am with your product! It fixed ALL my feeding problems. Thank you for taking the time to make a perfect mag. I keep coming back for more. I have 10 of these. Well worth the money. I have a carried Kimbers warrior, tactical, cdp on duty for years and the only magazine that she likes is the Wilson. I still have mags from 2003 that work. When your life depends on it, I only use Wilson. The factory mags that came with my SA Loaded 1911 were terrible. They operated fine, but were difficult to load. These WC mags not only operated beautifully but are buttery smooth and easy to load! I will certainly be purchasing more. I bought 4 of the wilson 7 round 1911 magazines for a Thunder Ranch class. Ill be honest at first I was aprehensive about using the mags because I shoot a Springfield 1911 Operator. After 3 days of intense Clint Smith drills the mags perfermed flawlessly. Magazines are one of those things you dont think about unless something is going horribly wrong, I was more than impressed, not 1 issue the entire time. I dopped them several times in dirt, snow, and mud, Id quickly wipe them down and go back at it. Im sold on the mags and cant wait to buy other products, especially a Wilson 1911 when I can afford it. These mags do what Wilson says they will do. Perform and function, period. I ran 200 rounds through the 4 mags I purchased from my Sig Tact Oper 1911, no problems at all. Solid buy. Used the new Wilson mags today...had no ftf which was a consistant problem with the Kimber mags. Would recommend these mags to anyone that may be experiencing ftf, or just wants a quality magazine. I own several of these mags and they have never failed to function... Period. Even after long fully loaded storage times months. This works great in my Kimber CDP II Pro. The reason I went with Wilson Combat instead of the Kimber factory mags is the nylon follower instead of metal and the extra round capacity. They do stick down below the handle but I use the 8 round mags at the range and the 7 for ccw. Theres a reason whenever you buy a 1911 the first thing you do is buy some of these, only magazines that wont fail on you when you need them! These are the only ones I trust with my life. 47-D, an instant reliability package. Ive been shooting 1911s for 5 years using nothing but these magazines for the most part. Theyve never failed me. In fact, they made a gun that had previously not wanted to feed reliably with the factory magazines it came with into one of the most reliable 1911s Ive ever shot. I went for over 5,000 rounds without a single malfunction using 47-Ds. I have the utmost confidence in this product and have no qualms about recommending it to others when asked about quality magazines for the 1911 platform. Wilson makes one hell of a product. Reliable, high quality magazines are an absolute must and these fit the bill perfectly. Do yourself a favor and pick some up, you wont regret it. WC 47Ds, the only Mag I have that works in all my 1911s. Never any problems. I wont buy anything else. 47D the only magazine in our range bag. 2 seasons shooting IDPA about every weekend and these mags are still going strong, getting ready for season 3!!! My husband & I both use them w/o a glitch in our Colt pistols. Well worth every penny when reliability is crucial. Thank you for such a fine product. These magazines are great. Much better than the factory mags that came with my Kimber. I have never had any fedding issues with these mags. I plan on buying many more of these as my 1911 collection grows. Over the years I have had my share of magazine disasters. I have purchased knock-off magazines that fell apart the first time they hit the deck while doing a combat reload and I have had others that failed to feed reliably. A good friend put me onto Wilson Combat magazines, the 47D to be specific, and now I will never use any others. They fit perfectly, feed reliably, and their follower will not score the feed ramp of my alloy framed Commander. Should the spring ever weaken, I assume it may some day, it can easily be replaced. The added round is just icing on the cake. In my honest opinion Wilsons magazines are the best available and a wise choice. Dont settle for second best for either range work or for self defense, put Wilson Combat on your side. I have been shooting a 1911 since the vietnam days of my early Navy Career. I have been using the Wilson Combat Tactical in all five of my 1911s. just received my recent order of an additional Four More 45ACP 8Rd, ETM Base magazines. cant get enough! Ive been shooting 1911 pistols for 25 years and believe these magazines are without a doubt the worlds best. Even before I owned a Wilson, I used these mags in other makes of 1911s with magnificent results. I own probably a dozen of these mags and would never consider anyyhing else. If your pistol does not function with these mags, there is something seriously wrong with your pistol. Stock up on these beauties; youll be glad you did. I have been using these magazines for years, stored loaded most of the time and they make my 1911 run like a Glock in terms of reliability. I have had to replace the springs twice in the seven years that I have had mine stored loaded and at the ready and with that, these things couldnt fail if you tried to make them. Everyone is using modern-style magazines, Wilsons in particular, for a very good reason: they work. See for yourself why and you will be happy. Its the one I have in all my 1911 defense guns. How can I say more I trust my life with them! These are the best 1911 magazines that I have ever used. Every single 1911 I own runs Wilson 47Ds. Ive never had a magazine related failure with Wilsons. If you are familiar with the 1911, you are surely familiar with this magazine. It is often considered the gold standard by which others are compared. A magazine is the heart of any semiautomatic handgun. If they dont function reliably, you may find yourself with a 38oz paperweight in your hand, when you need a gun. These magazines work like the heart of an Olympic athlete! Lightweight, exceptionally durable aluminum, excellent finishing. The spring is strong and the follower is durable. Be aware, these followers lack the dimple often seen on 7 rounders. They are also plastic, which can wear over time. Inspect them for wear and replace might as well replace the spring as well if the slide does not lock back on the last round. You can order replacements here. I have noted very minimal wear on mine after 4 years of use. Do yourself a favor and order a few of these. You can never have enough handgun magazines! Carry them, along with your CQB in the Wilson nylon pistol bag, and you will have the ultimate pistol-magazine-case trifecta. Every 1911 owner should have at least 3 of these! If you are familiar with the 1911, you are surely familiar with this magazine. It is often considered the gold standard by which others are compared. A magazine is the heart of any semiautomatic handgun. If they dont function reliably, you may find yourself with a 38oz paperweight in your hand, when you need a gun. These magazines work like the heart of an Olympic athlete! Lightweight, exceptionally durable aluminum, excellent finishing. They have always fed FMJ and hollow point ammunition reliably. The spring is strong and the follower is durable. Be aware, these followers lack the dimple often seen on 7 rounders. They are also plastic, which can wear over time. Inspect them for wear and replace might as well replace the spring as well if the slide does not lock back on the last round. You can order replacements here. I have noted very minimal wear on mine after 4 years of use. Do yourself a favor and order a few of these. You can never have enough handgun magazines! Carry them, along with your CQB in the Wilson nylon pistol bag, and you will have the ultimate pistol-magazine-case trifecta. I wouldnt hesitate to carry these magazines in my pistol off-duty to protect myself and my family. I hope to try their ETM magazines soon. Makes my RIA Tactical 100% reliable. I had odd malfunction while taking my CCW class in my new RIA Tactical. My CCW instructor thought it was due to the factory magazine that came with it and recommended I get some Wilson Combat magazines. I followed his advice and 6 months later have not been sorry. My budged priced 1911 from the Philippines now operates with 100% reliability. The claims on the website about making any 1911 function all the time are 100% true. I never have had a single feed problem with any of my Wilson 47D magazines. The 47D spring and shell are of a higher quality then the magazines I received with my 1911 and of my other non-Wilson magazines, which all have had feeding problems in the past. I will only use Wilson magazines in the future because of this reliability. Thank you. My 1911 had difficulty with failure to feed issues. After purchasing several magazines on the market, I finally bought a Wilson Combat 47D. The 47D is now all I run. Flawless performance every single time. Simply holding the magazine you can see and feel the immense quality and engineering. I have never been so impressed with the performance, quality and attention to detail from a magazine before. After using a Wilson Combat product it was obvious, I need to own one of their pistols. It will absolutely be my next 1911. This Mag as well as a few other parts, breathed new life into my old Colt Govt. The expert advise that I got from the Wilson staff was right on target. I received my parts within two days! Why do business anywhere else!!! Regardless of what brand name is on your 1911, you want the best available magazine to feed your thirsty blaster. The Wilson Combat 47D is the best magazine made for the 1911. I have tested all of the brands and used them in all configurations and the 47D Wilson Combat is the best and the first I will always reach for to feed ANY fullsize 1911. If you are having failure to feed issues this Wilson Combat 47D Magazine will go a long way into curing your feeding problems. The overall quality of the build, and the metallurgy are perfect. The placement, size, and attachment of the base pad are second to none. The spring and follower are probably the best on the market. Though I shoot over 2000 rounds per week, yes thats per week I pay specific attention to the performance and wear of my tactical gear. The polymer follower on the 47D is self lubricating and functions perfectly. If you are looking for the best in terms of looks, function, and performance, look no further than Wilson Combat. I have put over 10000 rounds on a single magazine with no cleaning, and it still performed flawlessly.